There is nothing quite like homemade jam. Well, there is nothing quite like homemade anything, really. And homemade jam is really so very simple to make that there is no excuse not to try your own! As we are not currently in berry-picking season I bought a couple of bags of mixed, frozen berries while they were on offer. The result was just as good as using fresh berries and, while it’s a saving on buying shop jam, it works out a lot cheaper (and is more fun) when you forage your own! If using frozen berries make sure you thaw them first. Place berries in a large pan. It does need to be a large pan – bigger than you think you need – because your jam mixture will rise as it boils so you do not want it to run over. Mash the berries. Peel and chop the apples and add to the berries. The apples contain pectin which helps the jam to set. Place on a medium heat. Add the sugar, stirring it in well. Keep stirring the mixture, heating it up until it reaches setting point. You can find the setting point by using a jam thermometer in the pan – the jam setting should be indicated but this is around 220°F/104°C. 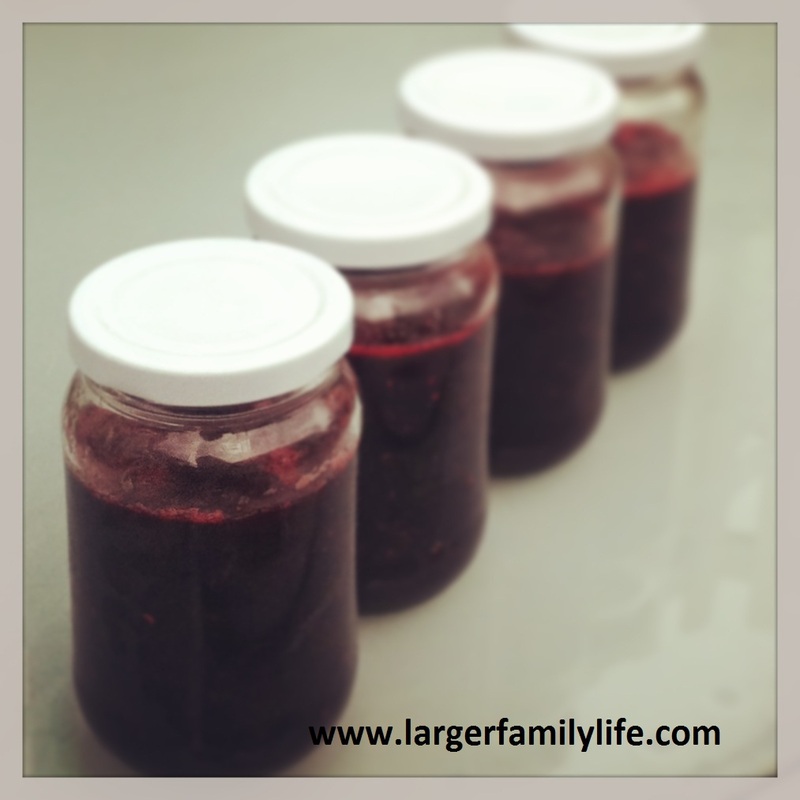 Once your jam has reached setting point you can put it into jam jars. Make sure that you’ve sterilised them first by putting clean jars into the oven at 100°C for ten minutes. Remove them carefully with oven gloves or a jar holder, then, using a jam funnel (or by pouring very carefully) pour the jam into the jars. Be extremely careful as the mixture is terribly hot! Fasten the lids onto the jars whilst the mixture is still hot – the vacuum that is created as the mixture cools down keeps the jam sterile for months. This makes it a perfect, frugal recipe to last throughout the year if you manage to bag a bounty of free or cheap berries at the end of summer!